How to Launch A Money Making Blog with These 5 Things. So many people are becoming aware of the potential income earnings from running a blog. The downside is, not a lot of people know how to even successfully start one. Truth be told, there is a wrong way and a right way to launch a blog. This post is laid out to give you simple and easy to follow instructions on how to launch a money making blog. If you are hoping to bring in additional income from blogging continue reading along so you can learn exactly what you’re going to need to succeed. 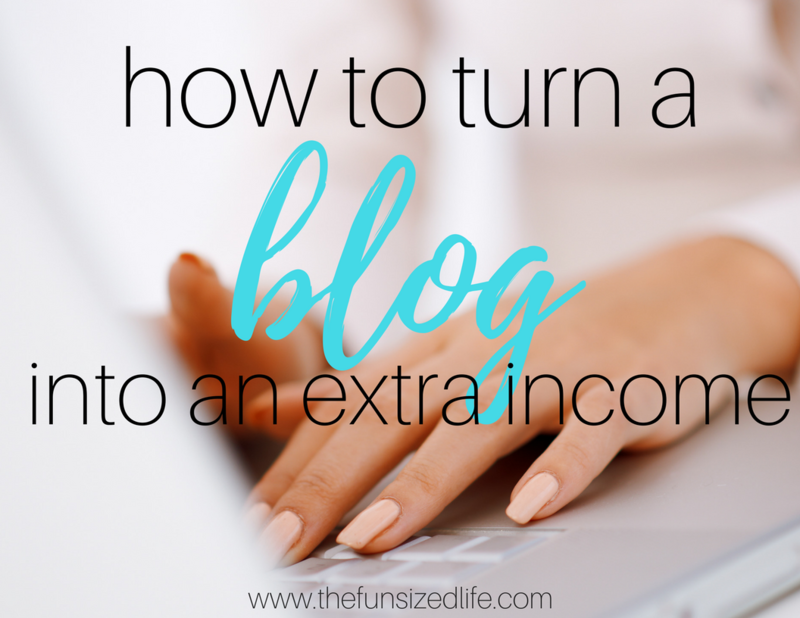 First of all, let me say, before I started blogging I read a ton of blog posts on how to turn a blog into extra income. The one thing I made sure to do was check each blogger’s credentials. I scoped out their blogs, I read their income reports. If I was going to take advice from another blogger, I wanted to make sure they were someone whose advice I even wanted. While I don’t share income reports, I did start making a substantial income from my blog within the first year. My goal is now to help other aspiring bloggers learn to create their own money making blog. My blogging course, The Fun Sized Blogging Basics is designed to do just that. In my course I will not only show you my exact marketing and Pinterest strategies, I will lay out how to schedule, how to make money, and how to manage your money once you have it. Every blogger will be quick to tell you that if you’re serious about this, don’t expect to make money over night. While this is true, I almost feel like I did start making money overnight. After learning the blogging ropes for about 6 months, I had to quit my other part time jobs. Because of this, I decided to kick my blog into full gear. Almost instantly I started making money from it. What this tells me is that even though there is a lot to learn about blogging, a lot of the effort has to come from you. All of these lessons and tips will not help you if you don’t put in the effort. If you think you’ve got enough drive and desire to launch a money making blog, then read on to see exactly what you need to get started. The benefits of using a self-hosted site seem to be never ending. Not only have I been blogging for almost 2 years, I also completely rebranded my blog. During this painful process, BlueHost was extremely helpful. I was so nervous that I would screw up my site permanently, lose all my followers, and end up crying myself to sleep. In reality, the exact opposite turned out to be true. I have BlueHost to thank for all of it. Getting Google Adsense allows a space to display Google ads and gives bloggers a percentage from using them on their site. Here is a great tutorial that will guide you through from start to finish. I have heard some bloggers say not to even bother starting with Google Adsense because you don’t make that much. Personally, I think when you’re just starting out, it doesn’t hurt to get any amount of money, no matter how small. Starting my blog with Google Adsense helped me pay for my e-mail hosting and provided a little extra spending money. Once your blog has started bringing in over 25K views per month I do recommend switching to Mediavine as an ad provider. Once I made the switch, my monthly ad income went from an average of $300 to $1,200. Affiliate links are another way to start bringing in income to your blog. What affiliate links basically are is recommending something you love to your readers and then earning a commission from it. When you are first starting your blog, I recommend trying out a site like Share A Sale. Share A Sale makes it very easy to browse multiple different companies that have affiliate programs. Just be sure to go with programs that you know and have tried. The Fun Sized Blogging Basics course also has a tutorial that fully walks you through how to find affiliates and how to link to them in your blog. Affiliate links can be so effective in fact that one blogger is making over $50,000 a month with affiliate marketing! Read my full review on her course here. Once you have established a solid blog, and a good following you can start to look into working with brands. Depending on how large your following is, you can start doing this early on. When it comes to working with brands you can reach out to them, or they can reach out to you. If you are just starting to launch your money making blog, the easy route would be to sign up with companies like Acorn or Linqia. These companies basically work as the middle man between you and brands. Brands will contact them and then they will reach out to you. Influencer companies manage the payments as well so you don’t have to worry about that part. However, because they are acting as a middle man, this also means they will be a taking a percentage of your earnings. Depending on the brands you work with, you may start to make a substantial income. Once you have more experience working with brands, you may want to start reaching out to them directly. One blogger, Jenny Melrose of The Melrose Family earns over $10,000 per months through working with brands. In her course, Pitch Perfect she lays out her exact strategies on how to land big brands and start making more money. Like any business that hopes to succeed, there’s a little investing that must take place first. Investing in quality hosting is super important and so is getting quality training. You may have heard the saying, “It takes money to make money.” That saying is incredibly true especially when it comes to launching a money making blog. The Fun Sized Blogging Basics – Learn my best strategies on how to make money blogging and how to keep traffic flowing in. I will give you guided tutorials on e-mails, Pinterest, Facebook and Tailwind scheduling. Check out my 5 free lectures to get you started. Building a Framework – Building a Framework is the best course for getting a new blog up and running. Created by Abby Lawson of Just a Girl and Her Blog, you will learn everything from how to launch a blog to how to make money and build your tribe. Food Blogger Pro – Food Blogger Pro is a terrific online course you can take that was created by the husband and wife team behind the wildly successful food blog, Pinch of Yum. Making Sense of Affiliate Marketing – Affiliate marketing is a great way to create an income from your blog. In this course, millionaire blogger Michelle from Making Sense of Cents shares her secrets to making over $50,000 a month from it! Pitch Perfect Pro – Pitch Perfect is a course I took hosted by successful blogger, Jenny Melrose. She will walk you step by step through how to pitch to brands and what to do once you’ve got them. MyThemeShop has a huge variety of WordPress themes so you can choose exactly what theme fits the style you are wanting to create for your blog. They are even currently running a sale. $19 for any theme! Another great site for WordPress themes is ThemeIsle. My personal e-mail provider is Constant Contact. You can read about how I grew my e-mail list from 500 to 5,000 in one month using some of their helpful tools. One of the most popular photo editors and graphic creators is PicMonkey. With them you can easily use collages, touched up images, and other design tools to create quality photos and graphics for your blog. Canva is the program I usually turn to when it comes to creating my Pinterest images and promotional posters. 10 Day Blogging Quick Start – A 10 day course that teaches you step by step how to start a blog. Created by successful full time blogger Abby Lawson. 10 Easy Tips to Increase Your Affiliate Income – Just enter your name and e-mail and you will be enrolled in the course. 5 Day Blogging Bloopers – Al my personal blogging mistakes. Avoid making the same mistakes by taking my course. Blogging Bloopers – Learn all my best/worst blogging mistakes so that you can avoid the same fate! Get started. Brand Pitch Cheat Sheet – A helpful cheap sheet to get you started working on pitching to brands. Choosing Your Perfect Niche Webinar – Choosing your niche can be tough as a blogger, here is a great way to get some serious guidance. This post is so very helpful! Can’t wait to CT and check out all your recommendations! Thanks so much Jen! Its tough to share enough without writing a novel! Great post! I just started blogging and this page is super helpful. I saved this post so I can look back on it :). Great!! I’ll have to keep an eye out for all your stuff! Thank you for sharing your words of wisdom! I especially liked the part on working with brands. That is definitely one area of blogging that intimidates me! Take the passive route! haha It’s all pretty nerve wracking until you get into it. At least for me! GReat advice!!! I’ll be reading again and taking notes! Wow! This is a great article with so much information to start a blog! I’m going to take notes and apply to what I’m doing. Thanks! So glad you enjoyed it Rebecca! Thank you so much for all of your advice and you’re blogging resources! They are very helpful. I just started blogging and I can’t wait to start working with brands! And I’ve heard a lot about tailwind but I haven’t felt the urge to commit yet. Maybe soon! Sigoni they have a free trial! So you don’t have to commit. You can just test it out first! There are so many helpful tips and resources here for any level of blogger. There are few here I am going to be trying for my own blog. Misty! I’m so glad it hear that. This was a tough post for me to write because I wanted to share enough without making people read too much! this is one of the best articles of this genre that I’ve read I hope to monetize this year and am just looking into courses on how to do that. I like the idea of brand ambassadorship so that what I think I am going to focus on. Thanks so much Yvette! I definitely recommend Acorn and Linqia They are a great place to start! I wish I had signed up sooner! This is a great beginning “How to” on where to get started. With great tips to set up on the right foot. Nice article. Well done! Thanks for these tips! I’ve been growing my blog for almost a year and finally seeing some growth and traffic. I’m going to look into some of these programs. So glad you liked it Joyce. I too have had to make those changes. My recipes and food posts just don’t get much traffic even though I love me some food and food pix! It took up a lot of my time that just wasn’t worth it. Ok, I am so happy I clicked on this blog! I am using the building a framework book too and have found it SO helpful! I’ve just started my blog and have hit a snafu-google ad sense still has not approved me! (Super worried about this) BUT it’s very reassuring to hear from someone who has taken a similar path as me and is doing good! Congrats on your success and lots of good luck to you! Oh Ginger. Let me tell you…I got rejected from Amazon. Could not get Adsense to work. Thought I’ve lost all my work. Re-done my posts um like 8,000 times…this is NOT an easy gig by any means but it is totally worth it! I am so glad you got Building a Framework. Abby does such a great job of leaving no detail out! She’s such a life saver. I love all of your tips for turning a blog into some extra money. I have been blogging for one year and have started to grow my income with my blog. That’s so exciting! It sure is a lot of work, but so worth it! Thank you for your awesome tips on how to turn a blog into extra income! I started my blog last year and it’s grown so much since I started implementing most of the tips in this article. So glad to hear! I have seen such huge improvement. It’s amazing what can happen when you finally make everything click! Wow you really jammed a lot of amazing content in this post! I just signed up for Ackrn because I had never heard of them before. Thank you so much for these tips! I also think I need to create better pop ups for my email list! So glad you liked it! Acorn has been a great company so far. As far as e-mail lists, it took me a while to find what worked but just make sure to get one started ASAP!